Lucy Spencer received her MFA in 1975 from the University of North Carolina, Greensboro. She was born in Philadelphia and raised in Winston Salem, NC, Norfolk, VA and Athens, GA. Spencer taught at both elementary and high school levels in North Carolina, and ran her own part-time art gallery. 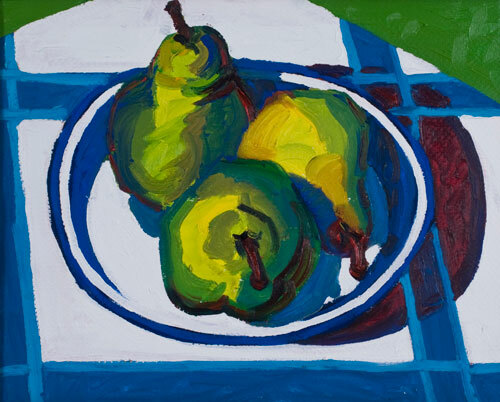 Spencer’s still life, Three Pears on a Plate, utilizes broad brush strokes and vibrant color to illustrate the play of light and shadow of fruit sitting in the sun. In her more recent work, she uses oils to paint expressive, ethereal landscapes. Her solo and group exhibitions include shows at the Weatherspoon Art Museum, Gallery 115, and Green Hill Center for NC Art. Permanent collections of her work reside at various locations such as R.J. Reynolds, Duke University Medical Center, and the Weatherspoon Art Museum.